Highly intelligent 'Single Vocal' detection, and classic 'Allround' detection. 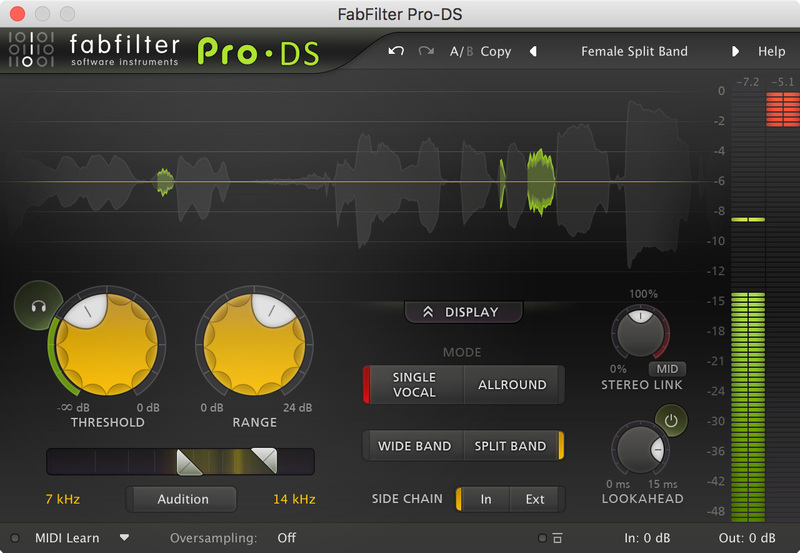 Adjustable Threshold, Range and High-Pass and Low-Pass side-chain filtering settings. Wide Band or linear-phase Split Band processing. Optional look-ahead time up to 15 ms. Optional mid-only or side-only processing. Real-time de-essing display, clearly showing the affected parts of processed audio. Side-chain input meter, making it easy to choose a good Threshold value. Real-time spectrum analyzer built into the HP/LP filter controller. Large and compact interface sizes (with or without the real-time level display). 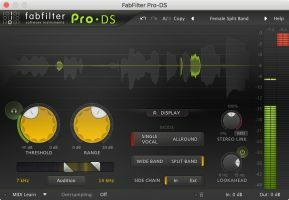 All the usual FabFilter features you've come to expect: perfectly fine-tuned knobs and controllers, interactive MIDI Learn, undo/redo and A/B switch, Smart Parameter Interpolation for smooth parameter transitions, an extensive help file with interactive help hints, sample accurate automation, advanced optimization, and more.